Where do we stand with snowfall so far this season? February and seasonal snowfall totals will continue to climb in several locations with more snow in the forecast for the next couple of days. As a low pressure system pushes through the central and eastern United States, an inch to a foot of snow is possible in spots. 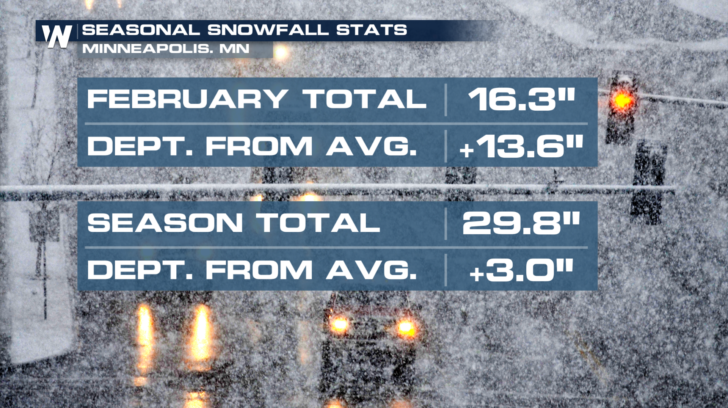 Here’s where some cities stand in terms of snowfall this season. These statistics include up to the morning of February 11th, 2019. We’ll add in more snow over the next few days, which may push more spots above average for snowfall this month and this winter. The Upper Peninsula of Michigan is expecting 5 to 8 inches of snow with the heaviest of snow falling in the middle of the day on Tuesday. 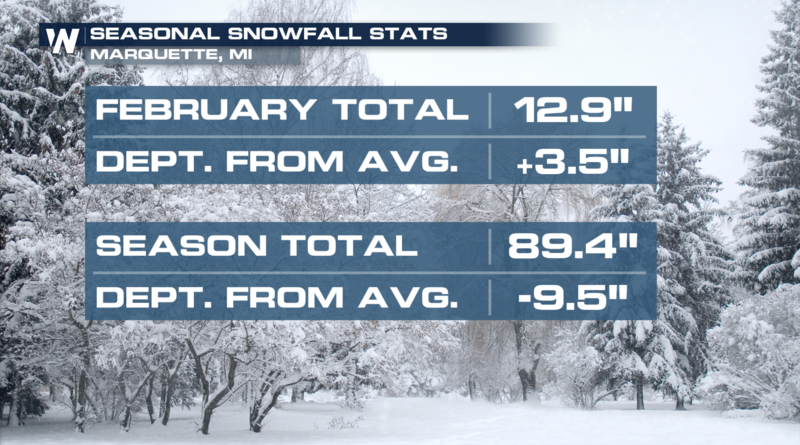 This would push Marquette closer to average for seasonal snowfall. 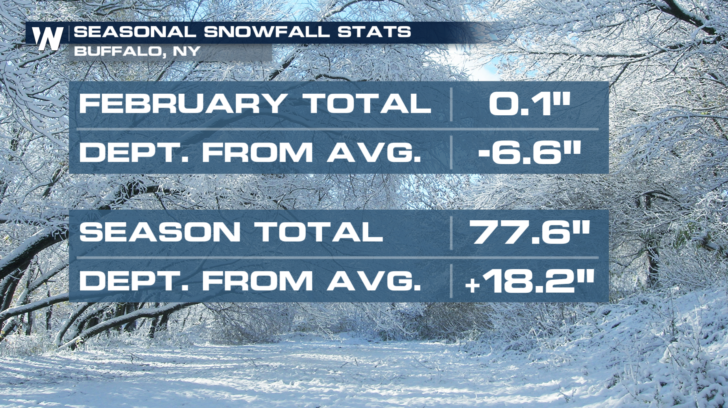 It’s hard to believe that almost 90 inches of snow is BELOW average for this time of the season. An additional 3 to 5 inches of snow is expected in the Twin Cities into Tuesday evening. This is on top of the 5.9 inches of snow from the weekend. Snow plus a glaze of ice will slow down the commutes in Minneapolis. Already the city is above average for snowfall and this will just increase that departure from average. The majority of the state of Wisconsin will remain under a Winter Storm Warning through Tuesday night. In addition to heavy snow, there is also a chance for freezing drizzle. Green Bay is looking at 8 to 10 inches of snow which would leave the city well above average for the month. Snowfall will vary across the state of New York. The far northern tier of the state could see well over a foot of snow by Thursday. Buffalo will see a mixture of precipitation with snow, sleet, and rain in the forecast. 4 to 6 inches of snow on the way for Buffalo through the day on Wednesday with a wintry mix hanging around through the end of the week. 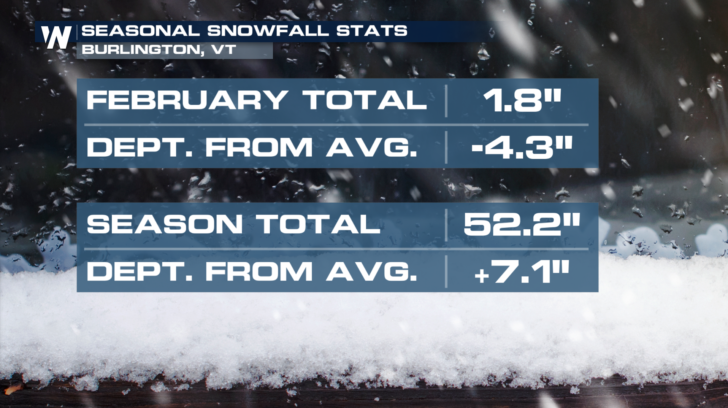 Into Vermont, snow totals will exceed a foot in spots. Burlington is expecting 10 to 13 inches of snow which would take the city from below to above average snowfall for the month.